The interim Seattle police chief was not originally among the finalists for the job. But Mayor Jenny Durkan announced this past weekend that Best was back in the running, and she is now considered the front-runner. This is the third of our three profiles of the candidates. The Seattle Police Department has undergone numerous changes in the past few years, introducing body-worn cameras, new technology to track crime and criminal investigations and extensive training programs on biased policing, crisis intervention, de-escalation techniques and use-of-force of reporting. 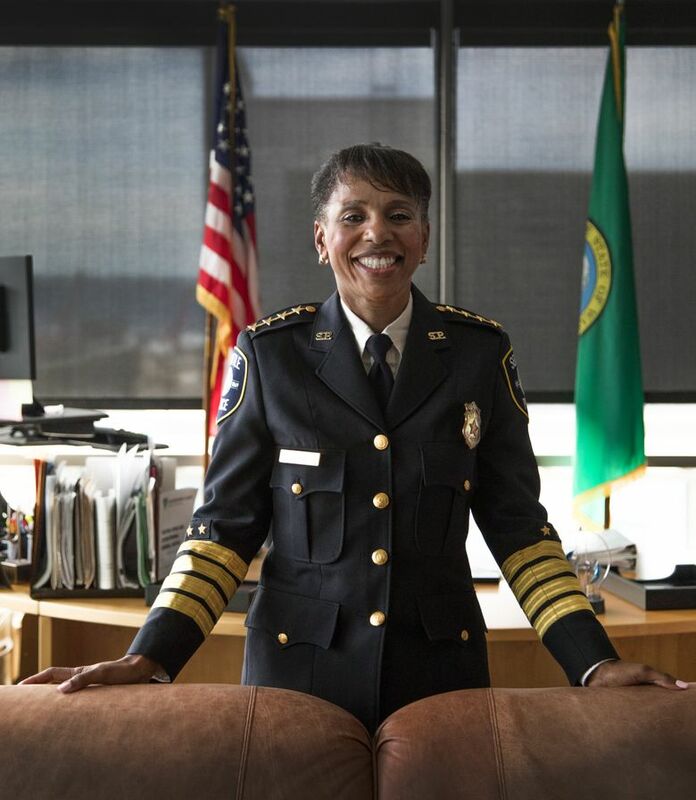 Through it all, Interim Seattle Police Chief Carmen Best, who is close to completing her master’s degree in criminal-justice leadership, says she has used her studies to tap the expertise within her department, putting people in positions to excel while pushing for greater police accountability. People who know Best say her passion and hard work are as much hallmarks of her personality as her easy laugh and warm, affable nature. “Genuine” is the word most frequently used to describe her. The Seattle Times is profiling the three finalists to become the city’s next police chief after the resignation this past year of Katherine O’Toole. Seattle Mayor Jenny Durkan is expected to make her selection this month. That support is what prompted a torrent of outrage — from the public, community groups and the Seattle Police Officers’ Guild — when Best was omitted in May from the list of three finalists for the permanent chief’s job. In a stunning reversal, Mayor Jenny Durkan announced this past weekend that Best was back in the running after Cameron McLay, a former Pittsburgh police chief, abruptly withdrew his candidacy. McLay was named one of three finalists on May 25, along with Ely Reyes, an assistant chief with the Austin, Texas, Police Department; and Eddie Frizell, an inspector in the Minneapolis Police Department. According to the mayor’s office, McLay is now in discussions about a different role, working in city government and focusing on police reform. Sources say Best is now considered most likely to get the chief’s job, in part because of the overwhelming outcry over her initial omission from the list of finalists. For 3 ½ years, Best was second in command to former Seattle Police Chief Kathleen O’Toole, who was tasked with implementing federally mandated reforms under a 2012 consent decree to address excessive force and biased policing. O’Toole announced she was stepping down late last year shortly before a federal judge found Seattle police to be in full and effective compliance of reforms imposed on the city after a string of high-profile incidents involving use of force. While she’s been running the department since the beginning of the year, Best is really known for her ability to build relationships across the city’s minority communities. While other police departments that have come under scrutiny by the U.S. Department of Justice have taken 10 or more years to implement reforms, Seattle police have done it in far less time, another officer pointed out. The judge’s January ruling kicked off a two-year review period in which the police department now must show sweeping reforms are locked in place. Best’s longtime service with Seattle police was seen as a disadvantage when the list of finalists was announced. Tim Burgess, chairman of the city’s police-chief search committee, said at the time that in some respects the needs for an outsider to lead the department worked against Best. Best, a 26-year veteran, was a member of the department when community complaints of biased policing and excessive use of force resulted in federal intervention. During an interview, she said that during much of the time leading up to the consent decree, she was a sergeant and lieutenant focused on directly supervising officers — and only gained a broader perspective of the problems facing the department as she moved up the ranks. Between 2012 and 2014, Best jumped from lieutenant to captain, then assistant police chief before becoming deputy chief under O’Toole. Aside from a couple of interim chiefs chosen from Seattle’s command staff or plucked from retirement to run the department during previous police-chief searches, Best would become only the second police chief in more than 30 years to rise through the Seattle ranks. In 2010, former Police Chief John Diaz became the department’s first internal candidate in decades to get the job, but he left the position less than three years later. Last week, members of the United Black Christian Clergy met with Durkan and discussed their bafflement that Best, who is African American, had been cut from the list of finalists for chief, said the Rev. Reggie Witherspoon Sr., pastor at Mount Calvary Christian Center in the Central District. Raised in Tacoma, Best graduated from Lincoln High School in 1983 and went on to study at Eastern Washington University, where she ran track. She joined the U.S. Army midway through college, serving three years, first in South Korea before returning to Fort Lewis — now Joint Base Lewis-McChord — where she worked as a supply clerk, then in an administrative role for the 9th Infantry Division. She left the military in 1989 and worked a couple of years as an accounts processor at Aetna insurance. It was during that time she met her future husband, Larry, a Boeing inspector for the past 30 years. It was also during that time that Best decided to test with the Seattle Police Department. Hired in 1992, Best has worked a variety of assignments, including stints in patrol, school safety and media relations; she’s served as a patrol supervisor, watch commander and operations lieutenant. She’s also had command positions in the narcotics unit, the robbery, gangs and fugitives unit and in community outreach. Best briefly served as commander of the South Precinct before her promotion to assistant chief of criminal investigations, then deputy chief in one of O’Toole’s early moves as police chief. A brown leather love seat anchors a small seating area in front of Best’s desk, a vestige from the tenure of former Police Chief Gil Kerlikowske, another supporter. Best joked earlier this week that if she is named chief, her first act will be to replace the worn, battered sofa. In addition to the Office of Police Accountability (OPA), which investigates allegations of officer misconduct, Best noted under the consent decree, the department also recently added the position of inspector general to audit specific misconduct investigations and flag broader concerns within the department, and the Community Police Commission (CPC), to represent community interests in recommending improvements related to reforms under the consent decree. The inspector general adds additional layers of accountability, she said. Houston Police Chief Art Acevedo said he knows Best through her involvement in national police organizations and membership on a law-enforcement task force on immigration. Though he doesn’t know Frizell well, he’s worked closely with Reyes, who was an assistant chief when Acevedo was police chief in Austin. “It’s all about the fit and what you’re looking for in a chief and the only one who can answer that is the mayor and her team,” Acevedo said. Of Best, he said: “She understands it’s important to continue to learn as a leader because this profession is evolving and you have to evolve with the times. Carmen is an open-minded person who was mentored by a phenomenal leader,” a reference to O’Toole. Sgt. Rich O’Neill, vice president of the Seattle Police Officers’ Guild, said he and other officers were insulted when Burgess, the search-committee chair who was a longtime Seattle City Council member and interim mayor, said in May that the need for an outside candidate worked against Best. Burgess, citing his involvement with the search committee and the nearness of the mayor’s final decision, declined an interview request for this story. As a white male officer, O’Neill, who has been with the department 38 years, said he knows “it wasn’t easy for a woman to come on the department 20-some years ago,” let alone a woman of color. “To be blocked by this artificial glass ceiling because you’re an internal candidate, it just seemed wrong,” he said. According to sources close to the selection process, there were concerns that Best was too friendly with O’Neill, who has been at the center of contentious negotiations with the city over police-accountability reforms. But Best and O’Neill independently refuted that, both saying they respect each other as professionals. Capt. Monica Alexander of the Washington State Patrol cold-called Best more than 20 years ago to ask advice about being a department spokeswoman after Alexander — then known as Trooper Monica Hunter — became the patrol’s public-information officer. That phone call began a lasting friendship and gave Alexander the opportunity to watch another African-American woman rise through the ranks of a police agency. Best wants to see the city and Seattle Police Officers’ Guild end contract negotiations that have dragged on for more than three years. The department’s officers and sergeants haven’t seen a pay raise since their last contract expired in 2014 — and that’s had an impact on recruiting new officers and retaining veterans. While not immediately alarmed by the number of departing officers, Best said there has been an uptick, with 79 retiring or transferring to other departments this past year, up from 71 in 2016. The city recently disputed the police union’s contention that officers were leaving in larger numbers because of unhappiness about the city’s politics. As an African-American woman, Best knows she’s a role model — and says little girls run up to her, excited to talk about becoming police officers one day, whenever she attends community events. But her race and gender aren’t just about demographics, she said.